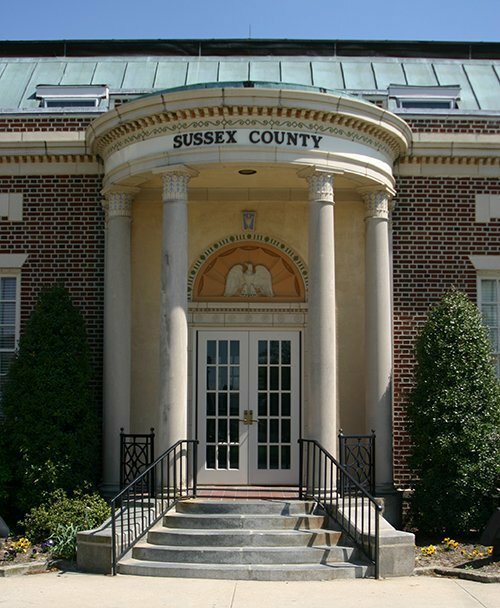 Sussex County government is the first level of government for most of the more than 200,000 residents living in Delaware's largest and southern-most county. At 938 square miles, the county is the largest in land area and ranks second in population size, making the interests and the issues within the constituency quite varied. The County government is led by an elected five-member County Council, with an appointed County Administrator managing all County offices and departments. The current Council-Administrator form of government was established in 1970 by the Delaware General Assembly. Residents of areas outside of towns and cities rely on County government to provide a variety of their core local services. These services include, but are not limited to, land use, building permits and inspection, 911 communications, paramedic service, property assessment and tax collection, community housing, economic development, airport/industrial park, public sewer/water, marriage and civil union licensing, estate probate, dog licensing, deed recordation and libraries. Other government functions such as police, roads, public health and trash disposal are services provided by municipalities and/or State government. Additionally, public education is administered by local school boards that are independent of County government.